Bear and Son Cutlery, Inc. Highest quality materials and years of experience in knife making combine to make Bear MGC knives comfortable in hand, a beauty to behold and still tough enough to go the distance. 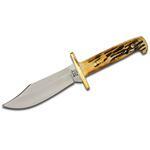 Their ongoing commitment is to make the best knives possible, make them in America and make them affordable. Bear wants everybody to be able to afford what they are proud to make! Not a bad knife. 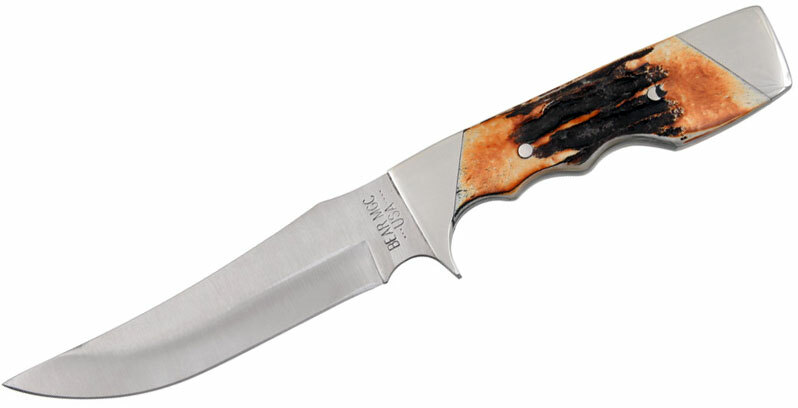 My research found that Bear & Son knives can be hit or miss but the one I received was good. Fit is fine and the bone handle looks good (made to look like Stag horn, not a bad job). Blade is sharp and I like this model's shape but the finish is so so; that's mainly why I rate this a 3- too many grind marks. Note that mine has "Bear MGC" stamped on blade which was the old name of the company. Seems to be serviceable and I will see how it holds an edge after use. Worth the sale price. Sheath is not great but performs its function. When I am buying a product online, I do a LOT of research. I do not like getting ripped off, see. So when I decided that I was going to bite the bullet and get a fixed blade knife, I knew I was not going to succumb to anything less than perfection for my needs.What are my needs? First and foremost, I want the knife to look nice; no "tacticool" garbage. I want it to have a full tang, and I want it to be sharp. I want all the materials to be durable. Finally, I want it to be made in the United States, so I can support my countrymen in their trials.Weeks prior to deciding on this knife, I had narrowed it down to a few options. I liked the Becker BK7, the G10 Case utility hunter, and some options from Knives of Alaska. Since they all seemed like reputable pieces, I settled the issue on price and appearance. I set my limit at $80 and browsed KnifeCenter for an affordable American piece. This knife fits the bill so far. It's sturdy, it's strong, and it looks great. I read on Bladeforums that it uses inferior steel, and I can't comment on edge retention yet—but most of the other complaints about this "shady" company have mostly been about fit and finish. 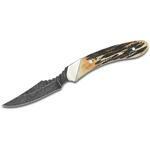 And while there are some asymmetrical aspects about the nickel bolsters added to the marriage of the blade and tang, there is absolutely nothing about this knife that will hamper raw, full-force performance in the field. People are just picky. Sure, the grind angle varies slightly, but this is slight enough as to be fixed with a stone, granted that you're not a chimp. In fact, maybe a chimp could do it too; they've been seen using tools in the wild, after all.The handle is not as thick as I'd imagined while waiting for delivery, but it works. The stag handle is great, and the finger grooves (which I expected to not fit my hand) do not affect me at all. And I have huge hands.One warning, though: the sheath is undebatably crap. The snap closure at the top is loosely threaded between some leather intervals, and as far as I know there are no inserts stopping the blade from slicing through the leather—which it can do with ease, as it arrived shaving sharp. The leather reeks of minerals, too, but it's sturdy and I'm not complaining further. Needs better description of blade than "upswept"
This is a great knife, well finished and the shape and feel in the hand, along with the weight makes for a good worker. 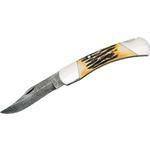 Hey, I wanted to share "Bear & Son Unswept Skinner w/ Genuine India Stag Bone Handle" with you from KnifeCenter.